rocky's bru: Has Lim Kok Wing lost his guli-guli? 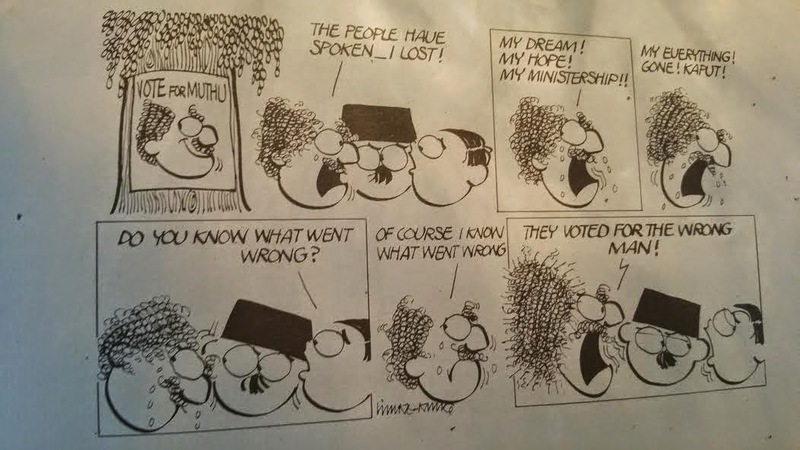 Monday, 25/5/15: In the 80s, Guli-Guli, the pro-harmony comic strip published in the New Sunday Times, defined the younger Lim Kok Wing, just as Kampung Boy had defined Lat. Lim Kok Wing was a politically-correct advertising name known also for spending a lot of time and money on welfare work. The man went on to do bigger things during the 90s and worked closely with several of the country's Administrations, not just in image sprucing exercises but actual political firefighting. A dozen years after Dr M stepped down as Prime Minister, Lim Kok Wing is a towering Malaysian still regarded as a "Mahathir man". His appointment as Najib Razak's advisor, at a time when the Tun is intensifying his scathing attacks on the PM, therefore, got a lot of people's attention. I'm not sure what Lim Kok Wing is supposed to advise Najib on. I can only hope, for Najib's sake, that his job scope includes managing how the mainstream media (including the NST group that he used to send his drawings to) respond to those attacks by Dr M. Because in my opinion they have not done the PM any favour in this department. What I got from several editors at Utusan Malaysia, NST/Berita Harian and TV3 is that their chief editors have been taking orders from an advisor close to Najib. The same name - Habibur Rahman - kept cropping up in my conversation with them, though none could claim to have met this chap. What Najib needs to do is defend and explain his policies, not attack his ex boss. I am quite certain Lim Kok Wing would agree with me, that the PM's existing strategy, which is to attack Mahathir to defend Najib, via the newspapers and prime news, is backfiring. But I also doubt that this Habibur Rahman or the other advisers of Najib would take kindly to LKW or anyone else barging into their territories. The ideal situation is for my friends the Chief Editors at NST, TV3 and Utusan to have the balls (read Life of Annie's Journalists need balls) and stand up against all and any bad advice coming from people claiming to have Najib Razak's interest at heart. Such advisers were the start of the downfall of Pak Lah not too long ago, these editors would still remember. Everyday the tails of the cats in the bag grow longer and longer. At the same time the tails are coming out of bags for all to see. They are no pretty sights to behold and you can bet that it would be long before not only the tails are coming out of the bags but all the cats will be out of the bags. He must also realises or shall I say envies Najib for living a life that he didn't have even though he is the richest man in Asia. But please keep coming out with more accusations because no one else can and also it takes a big thief to catch a small thief ! the name being mentioned seems familiar.pm najib directed him to meet me. we met and since we did not agree on strategies we parted ways. I feel sorry for najib.that is as much as I can say. Dear Rocky Bru...in this interesting article on Lim Kok Wing...you have indeed rocked the boat and those who know LKW will present to you and your column on the intrigues of this interesting so called "Professor Lim Kok Wing"...I have had a fair share of this man who is also my close friend but at arms length. I have had some good and nasty experiences and encounters with LKW during my liaison with him, when Tun Abdullah Badawi was the PM. I was also the one to have initiated our recommendation for the conferment of Tan Sri to LKW when I was serving under the late Tok Mat. LKW did a good roadshow in promoting the political image and strategy of Nelson Mandela in South Africa. Well in the process, LKW did the nation and country proud but along the way he stepped in many toes,which even Tun Mahathir or Tun Abdullah couldn't do much to change this egoistic academician, as LKW is a smart operator. LKW has a split personality and it's not easy to diagnose or size up his personality, both as a friend and enemy. Now he is back to rescue DS Najib, but I am afraid that DS Najib will fall into a messy trap, as LKW's strategies are no longer effective and maybe more of a liability to Najib. As I have said earlier in my comments DS Najib has to wake up from his wits and dreams in order to encounter the man who wants him down and out. Najib should have the guts to be on the offensive side and not defensive against this super image builder known as Tun Dr Mahathir Mohamed. Having said that, we love Tun Mahathir for what he has done, but not for what he is...We love Najib because he is the current prime minister, who unfortunately is a misunderstood leader and PM. The choice is yours DS Najib as whatever steps and decisions you make in the few months are crucial to UMNO and your own leadership survival. You have the best Advisers, I believe both within the government and corporate sectors, the approach to your own problems are equally important in order to chart your next step to the future with ultimate success! Those having Najib's interests at heart must be scallywag sycophants. Kok Wing jangan awak "keh gao" tahu tak?